If you are building a classifier then you must measure it’s classification performance. If you are building a robot to pick up an object, you have to measure its ability to pick up objects. Any AI technology that cannot be measured on one or more primary performance metrics cannot be evaluated against competing technologies. Secondary performance metrics are about efficiency. Efficiency in space, weight and power and even efficiency in a users ability to learn to use the technology. As the old saying goes: First solve the problem and only then make it efficient. There are more ways of measuring the performance of a classifier than those above, and if you are interested Wikipedia has a lot to say about it. For now we just have to give you a sense of what each of these measurements tells us. Suppose we were trying to learn some multi-label classification problem that has a few labels. One of the labels only ever occurred some tiny portion of the time, for example .1%. Notice that in this case, the correct answer is “no answer”, and if a classifier just dumbly returns no-answer it would be right 99.9% of the time! 99.9% sounds really good, but in this case its about as dumb as you can get. 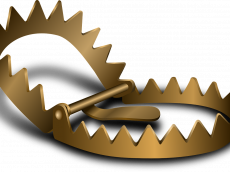 To deal with this problem we can disregard true-negatives or false-negatives altogether. This is the idea behind the precision metric. However, there is no one metric because we could even cheat again. What if we only took outputs from the classifier if it was really confident? In this case we could dramatically increase the precision but at the cost of not providing answers most of the time. So while the precision might go to 99%, if the classifier is only able to provide an answer 1% of the time, its not all that useful. To account for this, we need the recall metric. A high recall means that the classifier is providing answers most of the time. By raising the “confidence threshold” for our classifier we can increase its precision and lower its recall. 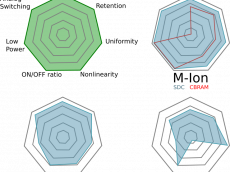 A composite measure of both recall and precision is the F1 metric, which is the “harmonic mean” of the precision and recall. In many problems you will find that the F1 value peaks at some confidence threshold. We call this the peak F1 score. Pulling the peak F1 score off the plot provides a good indication of your classifier’s performance in a general sense and can provide insight of what confidence value you should pick for classification. 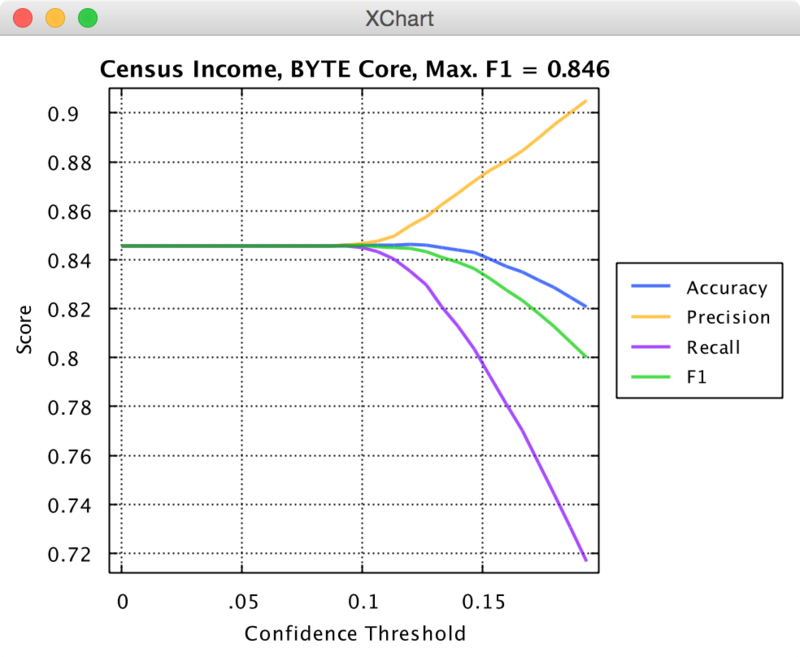 The receiver operating characteristic (ROC), or ROC curve, is a graphical plot that illustrates the performance of a binary classification benchmarks as its confidence threshold is varied. The Equal error rate or crossover error rate (EER or CER): the rate at which both acceptance and rejection errors are equal, is a metric that often cited in the literature when comparing binary classifiers. 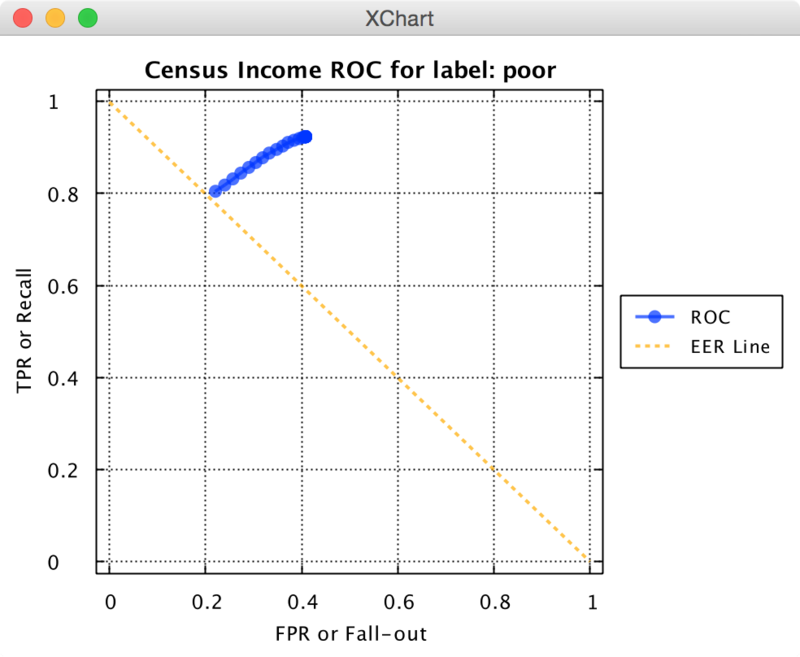 The value of the EER can be easily obtained from the ROC curve by looking at where the ROC curve crosses the EER line. In general, the classifier with the lowest EER is the most accurate. , where the EER would be roughly 0.2. The purpose of technology is to solve a problem in the world. How well it solves this problem should be measured by a primary performance metric. Consider a fancy neuromemristive chip. It may have many applications such as machine vision, speech recognition, and natural language processing. In this case we need at least three primary metrics to access these capabilities. The energy consumption, speed, volume are secondary performance metrics. A chip that is exceptionally space and power efficient but does not perform at acceptable levels on a primary performance benchmark is useless! That’s why energy consumption, speed, volume are called secondary. Tradeoffs between primary and secondary performance benchmarks occur all the time. However, secondary metrics are only important if primary metrics have been achieved. A chip claiming very high power efficiency must also demonstrate acceptable primary performance metrics, otherwise its power-efficiency claim is meaningless and only serves as a distraction from its limitations. At Knowm Inc., we are concentrating on building artificial intelligence that matches or exceeds biology in machine learning secondary metrics. In the article The Adaptive Power Problem, we show why building technology that performs as well a biological brains cannot be achieved with von Neumann digital architectures, especially when it comes to secondary metrics. Rather we are building a neuromemristive processor out of memristors to reduce the energy wasted shuttling data back and forth. Fortunately, voltage levels decrease, speed increases and volume decreases as well with the chip architecture, leading to biological scale learning technology. Since our goal is to create biological-scale learning technology, we will always publish secondary metrics along with the primary metrics.